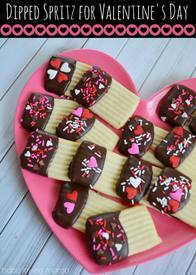 Spritz cookies for Valentine's Day? Yes, I actually believe that with a few holiday sprinkles you can make almost any cookie fit for a specific holiday. So with that in mind, I dipped my ribbon cookies in tempered chocolate and added some fun chocolate heart sprinkles and jumbo heart sprinkles. Ta-da! Instant Valentine’s Day cookie. And because these cookies are so wonderfully simple with a lovely texture and buttery flavor, it pairs perfectly with the chocolate. The shape also makes for easy dipping.